SCARBOROUGH'S STAR DISC - Maybe the largest in Europe. Can you recognise the asterism of 'The Plough" in the foreground? 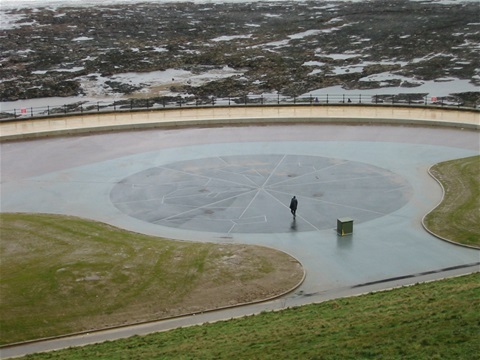 The disk, constructed on the site of the South Bay Pool, contains, as fibre optic terminals, the 42 brightest circumpolar stars (stars which never set) as seen from Scarborough. 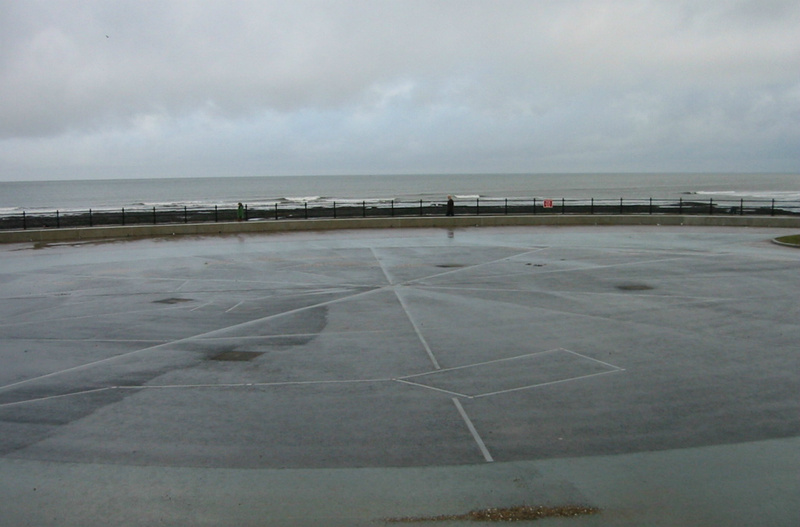 It also marks the positions of the sunrise points over the North Sea for various dates in the year. The idea for this stage in the development of the South Bay Pool was instigated by "Create", an arts and cultural agency, specialising in the setting up of temporary works of art and events. 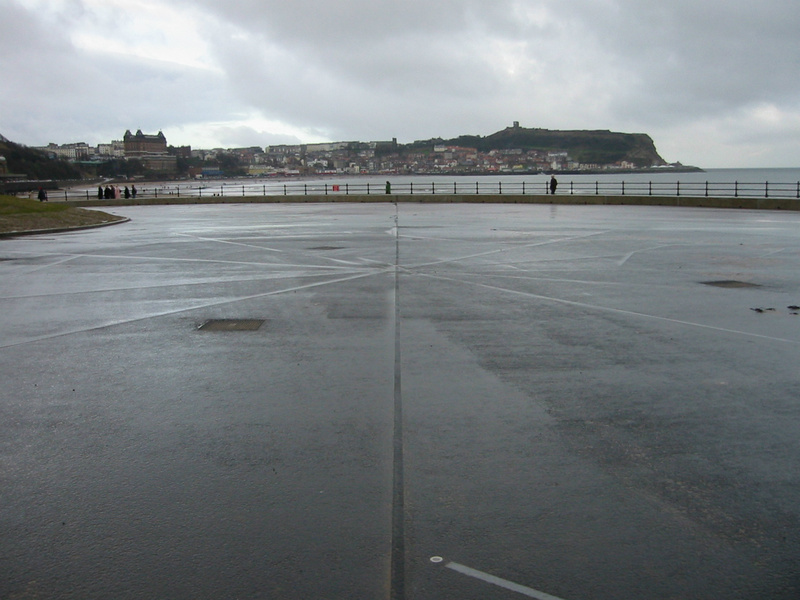 Also involved, in the ongoing project is the Scarborough Urban Renaissance of Public Space Group working in conjunction with Scarborough Borough Council. Funding was provided by "Yorkshire Forward" and the Borough Council. Because of my, and the Scarborough Astronomical Society's extensive involvement in the preparatory work for this enterprise, it was rather nice that the educational "illumination" became operational within a month of the 30th. birthday of Scarborough & Ryedale Astronomical Society! Before you is probably the largest star disk of its kind in the United Kingdom. 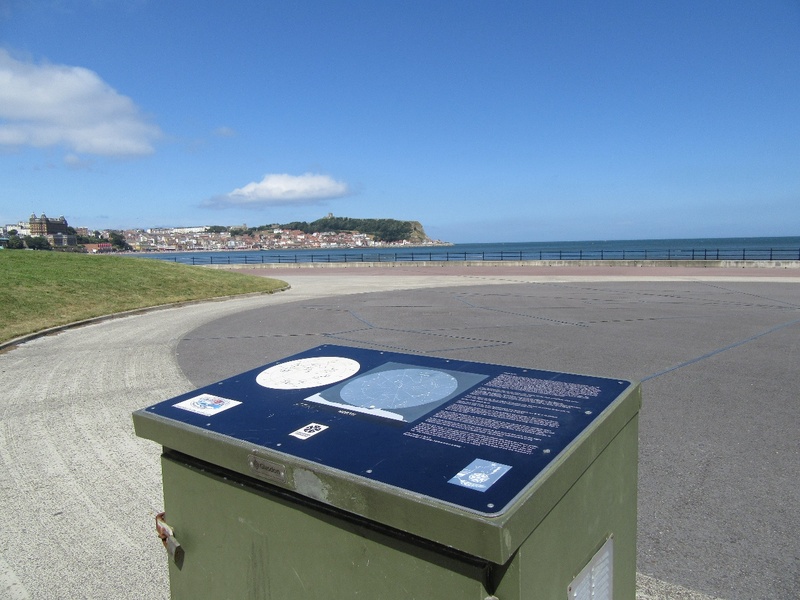 The 42 stars, which glow at night as fibre optic light points, show the brightest stars always visible in the northern sky above Scarborough’s distinctive headland, with the Pole Star almost at the centre. 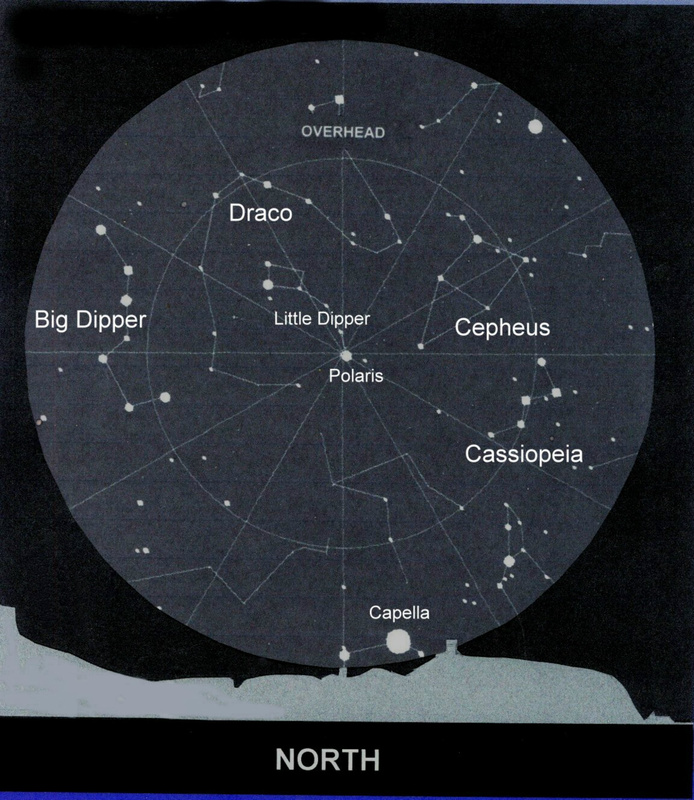 You will recognise the seven stars of “The Plough”, or “Big Dipper”, perhaps the most well known pattern of stars in the northern hemisphere. Also you will see the “W” shape of Cassiopeia, a vain queen who featured in a famous story of Greek mythology, together with her husband, King Cepheus of Ethiopia. Can you also spot the “Little Bear” with the Pole Star at the tip of his tail, and Draco the Dragon snaking around between the Plough and the “Little Dipper”, another name for the little Bear? The brightest star on the disk is Capella, the little she-goat, in the arms of Auriga, the Charioteer. This star, the sixth brightest in the entire sky, may be seen low in the north during summer nights, but almost overhead at midnight in midwinter. LONGITUDE: 00 degrees, 23 minutes, 36.8 seconds WEST of the Greenwich Meridian, and from here, notice how True North is exactly in line with the tower of St Mary’s Church! From the disk’s centre the positions of Sunrise over the sea at various dates can be seen. The dates are marked on the inner wave-wall seat. Please note that all the times mentioned in this description are G.M.T. so please remember to add 1 hour when Summer Time is in force! The stars you see before you are in the positions they occupy in the northern sky at astronomical midnight on June 21st each year. Stand on the June 21st date mark and imagine the entire disk placed in the sky above St Mary’s Church so that the far end of the disk is overhead and the edge nearest to you almost touching the headland. This is how to use the disk. As the earth continues on its orbit around the sun so the position of the northern stars seem to change. If you stand on any of the other dates and look at the star disk, you will see the different appearance of the northern sky at midnight on that particular date. Remember though, you will still have to face towards the north, and St Mary’s Church, in order to see the stars in their new position in the sky! Suppose it is June 21st and you want to see how the northern sky looks two hours earlier, at 10 pm. Each of the converging lines on the chart represents 2 hours of time, so if you stand at the edge of the line labelled “21st May” the view across the disk shows you the appearance of the stars two hours earlier. Similarly, if you want to see how the stars are positioned two hours later, at 2 am on June 21st, stand on the edge of the line marked 21st July. This method can be used for any date you require. Notice how the N-S line of longitude points to the tower of St Mary's Church. in the distance.